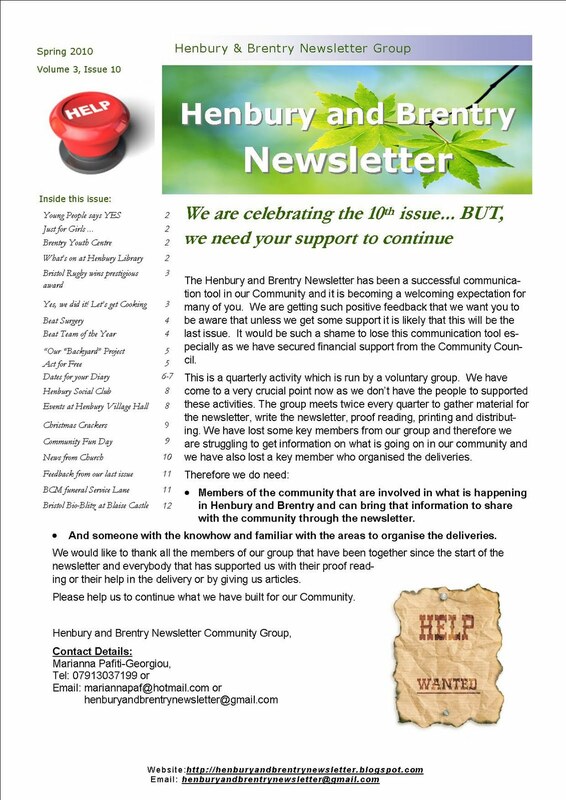 In this edition of the Newsletter we are highlighting the Council’s Ideas and Options paper for Henbury and Brentry’s green spaces, published on June 15th. This includes the proposals for the Crow Lane and Okebourne Road open spaces, and 6 others (as shown in summary on the Council's proposals article). The context of the Council’s proposals is as follows. In February 2008, the Bristol Parks and Green Space Strategy was adopted, describing a plan for upgrading and improving the city’s green spaces: the strategy includes improvement plans for formal parks, informal green spaces, play areas, wild spaces and nature reserves. These detailed 88 page document was put out for consultation in neighbourhood areas throughout the city. In Henbury and Brentry, consultation was organised by Heather Barham, who was appointed as the Area Green Space Plan Project Officer. Heather organised a number of well attended on-going public meetings in our area during 2008-2009, during which the Council’s document was examined in detail. Later in this process, a consultant was appointed to assist residents in making their views heard. On two separate occasions, members of the community (representing the Search and Transition groups Henbury and Brentry respectively), supported by their local councillors, made a statement to a full Council Meeting expressing their views. Apart from Brentry Hospital site, the two largest sites are Okebourne and Crow Lane. During the summer of 2009, two petitions were issued in relation to each of these two green spaces by those who support the second view below and around 1,700 signatures were collected. 1. The space should be developed to allow for the building of residential homes or elderly people’s sheltered housing, the rest of the space to be tidied with better facilities for seating, pathways and children’s play. Reasons for this view: Henbury needs to play its full part in the government’s housing plans, releasing space for new housing, both because funds thus raised would pay for green space improvement and because housing is urgently needed to provide homes for those without. Because we have a high percentage of elderly persons in Henbury, we especially need to provide homes for them. 2. The space should be preserved and better maintained as an informal green space and part of it developed as a nature reserve. Reasons for this view: It is an historic site and an important wild life refuge. The lily pond and old orchard should be preserved. Because of the extreme importance and shortage of natural green areas for city dwellers we cannot afford to lose any part of that which remains, whilst the building of new homes can be achieved in several other parts of Henbury. 3. A mixture of the two – some building combined with the development of the rest of the area as a formal rather than as an informal green space. Reasons for this view: both green spaces and new housing are vital and, because it is difficult to make a choice between these two ‘good’ outcomes, a compromise solution may be required. On June 15th the Council published its new proposals. See last page for a summary. The Council is inviting Bristol neighbourhoods to engage in a new period of consultation. The full document can be viewed at the Library in Crow Lane or on the Council’s web site. Because of the great importance of these proposals for the future of our community, we are urging residents to make their views known, either to our councillors or through this newsletter – some letters from residents are published in this edition. Henbury school children create community brand! Henbury School pupils Kane Davies, 12, and Josh Small, 12, with teacher and parent Kelly Mahoney, 32, have created a colourful brand for a community programme to help young people unlock their talents. 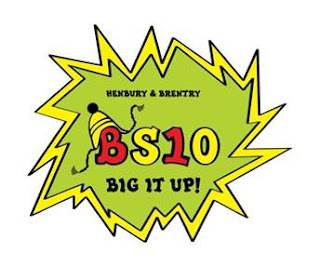 Their bold design, BS10 Big It Up!, was one of five created by schoolchildren, teachers, and parents at an Inspiration Lab and community BBQ. Their creative efforts were supported by designers from Uscreates, a London- based social design agency. All five brands were voted on by students, parents, teachers, young people and residents at community events, on a Facebook page, and on posters around Henbury and Brentry. Kane and Josh's idea received 169 votes of the total of 302 cast, and once voting was over the boys got to work on turning the brand into a final image with a professional graphic designer from Uscreates. The brand will soon be seen all over Henbury and Brentry at places and events such as Better Together's new Youth Forum, the Community Cook-Up (a weekly cookery club), and Vision My Future (films created by young people to explore future careers). All these community projects are funded by Inspiring Communities, a government programme aiming to support communities to raise the aspirations and educational attainment of young people. See all the photos from the Inspiration Lab and the final brand image on the Facebook page BS10 Big It Up!, or at www.bs10bigitup.com. For further information please contact Alan Boyles, alan@uscreates.com or 07980634253. Young Bristol is working in partnership with the Youth and Play Service and other organisations to deliver an intergenerational volunteer project in, as part of the Inspiring Communities programme. The project brings together 11-14 year-olds and the over-50s through community activities and events, and aims to improve relationships and understanding between the two groups. Young girls fromCentre host a regular tea party in the library for residents of theClose sheltered housing scheme. Everyone enjoys the event and conversation is varied and interesting, with topics ranging from school and family experiences to life in the Land Army and relationships. We are hoping to set up a similar event for residents of The Chalet just off Station Road, and other shared activities are also in the pipeline. If you have any suggestions for activities, would like to get involved or just want some more information, please contact Chloe Young Bristol on 0117 9537921, or by e-mail at cs@youngbristol.com. There will also be posters in Library and other community hotspots advertising upcoming activities and events. How would you spend £25,000? Henbury and Brentry Community Council are asking for your ideas about how to spend £25,000 in the local community. We have £25,000 to spend on projects that will engage and inspire young people aged 11-14, encouraging them to do well in their education. The projects will run from September until March 2011. Ideas for these projects can come from anyone in the Henbury and Brentry area, from young people, parents, carers, families, community groups and organisations working with young people – ideas are welcome from anyone. Once we have your ideas we will put them to the vote and you will have a chance to vote for the projects that you think are the best. We will try to include all of the ideas that we get, but we have to make sure that all of the ideas that are put to the vote are top quality and are aimed at young people aged 11-14. We will work with the Youth Forum to make sure we get this right! Everyone in the Henbury and Brentry area will be able to vote either through the website or through the voting boxes that will be in the library, some local shops and online. We are collecting ideas during July, voting during August and getting the projects going by September. Watch out for the results in September and see your ideas come to life! After a slow start the Inspiring Communities Project has widened its scope to include 'community initiated and sponsored' activities with a grant of £25,000 approx (net after management costs to the Community Council). The overall project, which is about raising the aspirations/achievements of those Year 8 children from our ward who would not otherwise achieve the target level of 5 GCSEs, is run by Sue Tunstall of Bristol City Council. The grant is held by The Community Council which has recruited a manager, Matt Dowse, to handle the 'participatory budgeting' requirements of its contract with Bristol City Council. In plain English this means that the £25,000 will be spent on activities/events both proposed by and voted for by residents of Brentry and Henbury. Matt Dowse, who will run the community-wide involvement and consultation, has wide experience in working with communities and young people. He would be pleased to answer your questions and hear any suggestions for activities if you would like to contact him direct on 0788 085 0007, or by email matt_dowse@blueyonder.co.uk. During July and August there will be a public consultation, as well as the opportunity for everyone to put forward ideas for projects and funding. A public vote to choose the projects/funding from the ideas that have been put forward will take place in August ready for the projects to start in September and run through until March 2011. This group is planning a stall for the Henbury Fun Day on August 21. “Save Money / Save Energy” is its main theme. ‘Sustainable Home’ leaflets from the Create Centre will be available and the energy consumption meters (which can be obtained free on a loan basis) will be explained. Additionally a ‘Top Ten Tips’ leaflet will be on the stall for everyone. For more information contact Kay Ridgewell on 0117 950 5721. Henbury Youth Inclusion Project (YIP) works closely with local families, schools and neighbourhood police to support young people in Henbury and Brentry. Our project workers provide one-to-one support for young people to help prevent involvement in crime and anti-social behaviour, and to enable youngsters to reach their full potential at school. We have been pleased to play a part in reducing the recorded levels of anti-social behaviour within the locality and hope that we can continue to make an impact. In addition, Henbury YIP also runs regular open sessions at Brentry Lodge Youth Centre on Machin Road, where ALL young people aged 12-17 are welcome. During term time, we are open for Manic Monday from 5:00-8:00 and Wicked Wednesday from 3:30-6:00. During the summer holidays, our Wednesday opening hours will change to 1:00-5:00, providing a whole afternoon’s worth of fun. There are loads of different activities for young people to get involved in: the youth centre has a sports hall, outdoor sports court, pool table, table tennis, arts ‘n’ crafts materials and internet access. We have also recently re-launched our popular mini-gym sessions, helping young people to stay fit and healthy through use of a suite of exercise equipment and free weights. Project worker Jerry Pearcey assesses the fitness of young people who want to use the gym, talks about their aims in getting fit, and then helps them to devise a personalised routine incorporating work on the treadmill, cross-trainer, exercise bike and rowing machine. During last year’s school summer holiday, we provided loads of extra activities such as parkour, graffiti art, t-shirt printing, henna tattooing and DJ mixing decks for young people to try. This summer, we are again planning to offer plenty of entertaining choice, with activities such as cookery, trampolining and nail art already booked and much more to come. We see new faces at our open sessions every day and all young people are welcome, so why not come down and try it out? Karen Thorn is Henbury YIP’s Project Coordinator and she or any of her team are happy to answer any questions you may have: give the office a call on 0117 377 3658, or pop in to see us at Brentry Lodge. 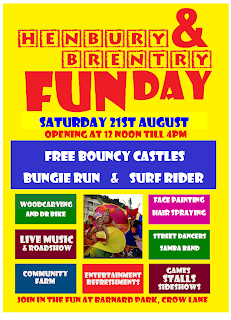 The Henbury YIP team will also be face-painting at the Henbury & Brentry Fun Day on Saturday 21st August, so if you would like to try out a new look for the day, come and find our stall and say hello! We are a local Holiday Playscheme (commonly known as HAHA) which was formed in 1994. At that time we used to meet at various locations around Henbury and Brentry i.e. : church Halls, the three primary schools, halls and the green open spaces. These locations have been condensed and we now meet at Henbury Court Primary School during most school holidays, from 10.00am-4.00pm at a cost of £7.50 per child per day. We do various activities e.g. crafts, games, swimming (over 8’s), outings to adventure parks, cinema, ten pin bowling etc. We are Ofsted Registered and all staff are CRB checked. Children must be 5 years to 11+ years of age. We do send notes home with the children who attend the 3 local primary schools and put posters in local shops, library, etc., to let you know how to access us. For more details contact Maddy on 0117 9836819. If you would like to try judo, do come and join us on Fridays from 6-7pm at Henbury Court Primary School. The Site Allocations and Development Management Options Document for Southmead and Henbury Neighbourhood Partnership area has been produced specifically to seek your views. The document proposes options for sites in Henbury which could be developed for new homes, jobs or shops. It also advocates the protection of land for open space, nature conservation or for uses such as industry, and contains ideas for new policies and guidance when planning decisions are made. In Henbury and Southmead 13 sites have development options proposed, 8 of them in Henbury/Brentry (see the summary of the Council’s Proposal). There is also a Drop-in event on Monday 27th September at The Greenway Centre, Doncaster Road, Southmead from 12noon - 8.00pm. The documents can be viewed on-line at www.bristol.gov.uk/siteallocations, or at your local library or customer service point. If you would like to speak to someone about the Site Allocations please phone 0117 903 6725. There’s a Neighbourhood Forum Meeting for Henbury residents on Wednesday 11th August at The Scout Hut, Tranmere Avenue from 6.00–8.00pm. The Forum is open to all residents and is the place where issues and concerns about what is happening in your neighbourhood can be raised and what can be done to solve any problems. The Police, Council and other services are working together in the Forums, which expand on the success of, and incorporate, the PACT meetings which have been happening for some time in the city. We look forward to seeing you! Surface dressing to the following roads: Ison Hill Road; Treverdowe Walk; Battersby Way; Greenway Drive. The Newsletter (£2500); HAHA youth holiday activities (£2000); Youth Inclusion Project (£1000); Emmanuel Youth (£500); Henbury Old Boys work on Girls Changing Rooms (£1500); Walking Group (£500); Holiday activities jointly funded with Southmead for young people in both wards (£1500). The fifth Annual Fun Day will take place on Saturday 21st August and promises to be bigger and better than ever. As usual there will be many free attractions for children of all ages. This year Cycling City will be there with ‘Dr Bike’, so bring your cycle along for a check and there will also be the opportunity to decorate your cycle, buggy or scooter free of charge. Cycling City are also funding a BMX cycle track where youngsters can try out their skills. 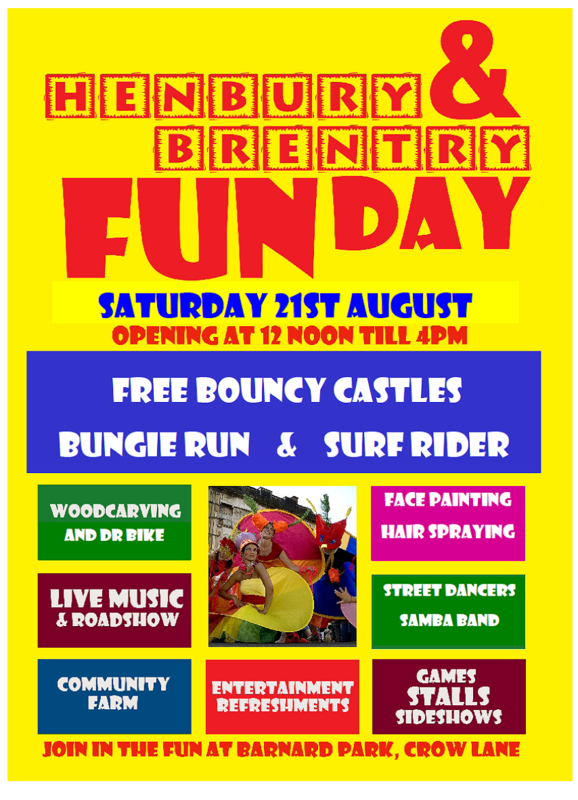 The Henbury Samba Band and local street dancing groups will entertain, and there will be music from North Bristol PA Hire, plus stalls, games, refreshments and much, much more. So make a date to come along to your community summer event – you won’t be disappointed, but you‘ll be sorry if you miss it! Brentry is still under-represented at the Community Council, Neighbourhood Forum meetings, and at the SEARCH Group meetings. There are issues that concern everyone but also there are sometimes issues specifically concerning Brentry and its residents. If you live in Brentry and feel you could come along to any of our meetings and either voice your opinions and concerns, or just to sit back and listen, you would always be more than welcome. 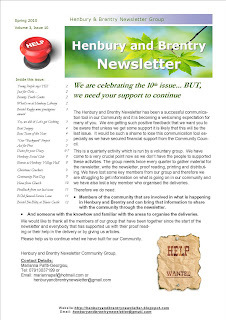 Henbury and Brentry form one community and we need and welcome input from both areas. Please consider joining us at one of our forthcoming meetings. We need you. At last we can kick-off this summer and all enjoy the warm sunshine. We can open our doors and windows and let in the cool air, but please be careful that this is not the only thing you let in. The summer also signals one of the busiest times of year for the burglar. - Lock away garden tools or other implements which can be used to break a window. - Don’t let the post pile up – ask a friend or neighbour to clear it. - Ask a neighbour to watch out for parcels left on the doorstep. A new pharmacy opened on the 1st May at Willow Tree Surgery, Henbury, providing a much needed service to the patients of Henbury and the surrounding areas. The new Independent Pharmacy is run by Pharmacist, Simon Harris who has worked for all the multiple pharmacies in various roles. When asked why he wanted to open his own Pharmacy replied “ I want to provide excellent customer service with the personal touch, that only an Independent can provide. I am really enjoying meeting the patients and look forward to welcoming even more to Willow Tree Pharmacy”. Simon has been busy since opening and has already set up a free prescription collection and delivery service available to any of his patients. He offers other services including free blood pressure checks, free medicines check-up and he even has a special machine at the Pharmacy where asthmatic patients can test out their inhaler technique! For anyone suffering from hay fever he is operating a service where you can see the Pharmacist and receive advice and your medicines free of charge if you do not pay for your prescriptions (certain conditions apply). The Pharmacy is also part of 4YP Bristol and you can collect free Chlamydia screening kits, free condoms with the c-card and free Emergency Hormonal Contraception for under 25’s. All this on top of what you would normally expect from a chemist! All patients are welcome to use Willow Tree Pharmacy, not just those who are registered with Willow Tree surgery and Simon offers competitive prices on both private prescriptions and over The counter medicines as well. “If you find a product cheaper I will match the price” said Simon. If you would like Simon to pick up and deliver your prescriptions or have your dossette box made up then please contact him at Willow Tree Pharmacy (0117) 9508975, or visit his website www.willowtreepharmacy.co.uk. “I can’t wait to meet you” Simon Harris. This tasty and nutritious frittata is simple to make and is ideal for lunch or supper. Serve with a mixed baby leaf salad and fresh crusty bread. Variations: Use 2-3 shallots or 1 leek in place of onion. Add a pinch or two of freshly grated nutmeg in place of dried herbs. 1. Heat olive oil in small non-stick frying pan (about 23cm/9in diameter), add onion and cook gently for 5 minutes, stirring occasionally. Add potatoes and spinach and cook for 5 minutes, stirring occasionally. 2. Meanwhile, beat eggs in a bowl, add dried herbs (if using) and a good seasoning of black pepper; set aside. 3. Sprinkle cheese over vegetables in frying pan; pour egg mixture over cheese and vegetables, tilting pan slightly to spread egg mixture evenly. 4. Cook over a medium heat until eggs are beginning to set and frittata is golden underneath, preheat grill to medium. 5. Place pan under grill; grill frittata until cheese is melted and top is golden brown. Cut frittata into wedges to serve; garnish with fresh herb sprigs. Serve with a mixed baby leaf salad and fresh crusty bread. Some of you may take for granted the beautiful local parks and woodland resources that exist in our community. We are a group of concerned residents who are dedicated to promoting and enhancing access to these areas so all residents can benefit. There are many opportunities for young persons, families and groups to use these parks. The Council is currently asking our community for feedback about their proposal to sell-off significant parts of these parks. For example, this hilltop, with a clear view to Avonmouth and Wales, is on the chopping block. We want to help the residents of our community get actively involved with decisions that affect our local environment. We are seeking individuals like ourselves who want to participate, promote, and sponsor activities which benefit the local parks and community. Please join the discussion - your voice is very important right now. 1st June saw seventeen excited travellers leave a sleeping Henbury bound for an early morning flight to Marrakech. They were all part of Henbury Travel Group's latest adventure, this time to North Africa. Morocco is probably the closest country to the UK where the culture is so vastly different that you know you've arrived somewhere exotic as soon as you get outside the airport. As our Riad (that’s a traditional Moroccan house, if you don’t know) was in the heart of the Medina, our bags had to be taken in by donkey and cart, through the manic streets of the souqs. The Riad had a very welcome pool, and also a rooftop Jacuzzi, so the exploring had to wait while we recovered after our journey. Marrakech is as exotic as it sounds and the Djemma El Fna square is a sight to behold, especially at night. The constant bargaining for goods and the excessive tipping culture can be a bit tiring but it's a fun experience. Two days later it was off to the coastal city of Essaouira, known as the ‘windy city’ and therefore perfect for wind surfing, kite boarding etc. We soaked up the sun on the rooftop of our hotel and watched the fishermen bring in their catch. A walled city with battlements there was much to explore, by foot, cycle or camel. Our third port of call took us into the Atlas Mountains and an amazing Kasbah at the foot of Jebel Toubkal second in height only to Kilimanjaro. This time our luggage was taken up by mule. It was fascinating learning about the way of life of the local Berber people and being able to trek around their highland villages. The British Ambassador to Morocco visited Imlil while we were there, and we thought the flags were out for us. With good company, food, accommodation and places of interest everyone came home happy with great memories. paulthompson29@activemail.co.uk Tel: 0117 940 9956 or 07840 986169. If your garden has become too much for you to manage, there could be something you could do about it. GardenShare Bristol is a project which tries to match up people who have underused or unmanaged gardens (because of their physical mobility problems or other reasons) with people who want to grow their own vegetables etc but have nowhere to do it. By sharing some or all of your garden with a local grower you can get a free supply of home grown vegetables as well as regular visits from someone in your neighbourhood. There is a particular demand at the moment from growers in Clifton, Southville, Bedminster and Totterdown. The above article appeared in the Spring issue of the Bristol Older People’s Forum (BOPF) Newsletter. This is a great idea and there must be people in the Henbury and Brentry area who either would like to work a garden but do not have one, or have one but are no longer able to manage it. If you are one of these people, contact Garden Share for details. Fifty of Henbury and Brentry’s senior residents attended a lunch at Henbury School on Thursday 3rd June. They were picked up from their homes by mini buses and were served a delicious three-course meal in the school hall, which had been cooked by pupils of the school assisted by PC Nick Merrick. There was live music during the meal which was followed by a few games of cash-prize bingo then music to sing along to. Each guest went home with a small bag of home baked cakes for their tea. Members of the Events Group were assisted by several girls from the school volunteering with Young Bristol, our own PCSOs and Community Safety Officers. Henbury School very kindly allowed us to use the hall and facilities free of charge. We would like to thank all those people who helped and say a special ‘Thank You’ to Nick, his wife, Lisa, and all the young people involved in making the day such a success. There have been a lot of very favourable comments from the guests, who all seem to have had a really enjoyable day. Many are asking when the next one will be!! We would hope to be able to organize other events for the older generation of our area at a later date, so watch this space! The afternoon was funded entirely by money collected during the Fun Day and the Christmas Cracker events last year. We would like to thank all those who gave so generously. The collecting buckets will be out again this year!! I have lived close to the Crow Lane Open Space for nearly fifty years and I, like many others, am appalled at the recently released proposed plans for the council to sell off a good portion of the Open Space to developers to build 161 houses. This site has been classed as ‘a poorly and misused backland site’ which is ‘no longer required as an open space’. What we need is not development but regular management and maintenance of the site by the council so that it is fit to be enjoyed by our community. This just has not been forthcoming in past years. The official documents show that the proposed building would take a lot of the land down the length of the stream on both sides, closing off several cul-de-sacs, as well as at building at other sites on the Open Space. The plans also show that maybe we could get a few ‘improvements’ such as a couple of ponds ‘for the wildlife’ – (that is, of course, if it hasn’t been completely scared off or destroyed by the developers!) - a possible children’s play area and perhaps some public toilets! These and any other ‘improvements’ would be funded by the money the council would get from the sale of the land. However, that money would go into a ‘central pot’ to be used throughout the city, not necessarily to be used on what would be left of our Open Space. So we could be sacrificing our green space to fund the enhancement of parks and green spaces in other districts! These documents are available on line on the Bristol City Council website or a copy can be requested by ringing 0117 922 3719. They are also in the library. I urge you to read them. I feel that we, as residents, must strongly raise our objections to these proposals as loudly as we can. The council will be holding a ‘public consultation drop – in’ for us to view the proposals and to comment on them. However, at the moment, that consultation is to be held on 27th September at the Greenway Centre in SOUTHMEAD! The consultations across the city began in June and end on 29th October, giving us, in Henbury, only one month to lodge a serious objection. Our local councillors are pushing for our ‘drop – in’ to be held in Henbury, but whatever the council decide to do, there will definitely be a meeting well before that date to inform Henbury residents of the plans and to give us the chance to show our objections. We are supported by both our councillors in this and by Charlotte Leslie, our MP. Please watch for information about the meeting and take the time opportunity to your voice and give us your support, because if we don’t raise a strong enough objection, the plans will go ahead, taking a good portion of the land. This will set precedents for future further development and we could lose all our Open Space forever. We have to fight for our Green Space NOW. Bristol City Council’s site allocations paper highlights 3 sites in Henbury and 5 sites in Brentry for housing development. There has already been negative community reaction regarding the Crow Lane and Okebourne open space sites, and we can expect further opposition when plans for the remaining 6 sites become more widely known. - Some of them are clearly unsuitable, others less so. - There is a proven need for additional housing in Henbury and Brentry with 389 people on the council waiting list. - Henbury ward has one of the largest elderly populations in the city, some of them needing very sheltered hous- ing. - Land on the road frontage of Crow Lane open space should be reserved for future public buildings such as a community centre or health clinic. It’s easy to say No to the proposals, but I believe that compromise will serve our community best. Please give your views at the public meetings. Since our last issue and the voice for help we had lots of feedback emails. We would like to thank you all for the kind words and positive feedback. We found out how important tool we are for this area and you gave us a big push to keep on doing what we’ve been doing. A very special thank you to the people who offered to help us. We are still in need of people in key positions to help us bring in news of what is going in our Community. With the last issue it was the second time that we came very close to stop the newsletter and again like the previous time we came out of the crisis stronger. There we are, with four more pages. Our newsletter became slowly a strong way of communication in our area. Thanks to all of you who give us the power to keep on working for a better Community. This month we have to face a very big issue for our area with the Proposal for the green spaces from the Council. Almost 1/3 of the newsletter is giving details and information about this. Do send us your opinions about the proposal. We need to know what people of the affected areas think about it. We have already published two letters about that. You may also notice that our Youth pages have more and more to say about the Inspiring Community Project. We all hope that our youth will get the best from the project. We deserve and need this kind of work in our area. Don’t forget in August our biggest event of the year. The Fun Day at the 21st of August. We all have to be there. We will be there too. Please do send us feedback about the day and if there is anything you want to change or any ideas for next year. Finally, we would like to thank the Funeral shop at Crow Lane for the donation to our newsletter. And also to welcome any other donations or adverts from any of the organizations in our area. If you would like to give us an article or your input for the next issue please send your email to mariannapaf@hotmail.com or contact us before the 2nd of October ‘10.